Family and friends may call at the First United Methodist Church, 117 N. 2nd Street, Clarksburg on Friday from 4:00 to 8:00 pm, where funeral services will be held on Saturday, January 26, 2019 at 11:00 am with Reverend Greg Godwin officiating. Interment will be in the Bridgeport Cemetery. Beloved wife and mother and respected educator Mary Louise Coberly Marquess of Clarksburg, West Virginia, quietly passed on January 22, 2019, smiling and caring for others to the last. She is survived by her son Lawrence Wade Marquess and wife Barbara Ann, of Denver, Colorado; daughter Linda Elise and husband Kelly Danges of Stroudsburg, Pennsylvania; daughter Barbara Marquess of Marietta, Ohio; and daughter Marsha Marquess of Julian, North Carolina; by her grandchildren Micah Danges (Becky), Evan Danges, Liza Danges (Jamie), Sara Marquess, Wade Marquess (Claire), Katherine Rumbaugh, Madeleine Rumbaugh (Joshua), Cecilia Washburn and Jacob Washburn; by her great-grandchildren Abrianna, James, Joslyn, Sydney, and Pierce; and by constant friends Vince and Margie Collins of Morgantown, West Virginia. Mrs. Marquess was born on December 11, 1926, the second daughter of Levi Wade and Blanche Pfau Coberly of Elkins, West Virginia. She recalled her childhood in Elkins fondly, surrounded by friends and relatives including her sister Willa Jean, who when four years old traded Baby Mary for the neighbor’s collie. Once traded back, Mary Louise attended Elkins public schools and in 1944, entered West Virginia Wesleyan College, where she studied sociology and music, made many lifelong friends, and met E. Lawrence ‘Larry’ Marquess, the Army artilleryman-turned-history major with whom she would spend the next 66 years. Mary and Larry graduated together in 1948 and were married on June 1, 1949, before moving for Larry’s graduate studies to Bloomington, Indiana, where they greeted “little” Larry, the first of their four children. Mrs. Marquess grew up in a family of teachers and was herself a respected English and grammar teacher for many years in Harrison County, first at Gore Junior High from 1964 to 1981, and then at Roosevelt Wilson High School until 1988. Following her retirement, she was recognized for her commitment as a volunteer, coordinating services and resources for area residents in need. 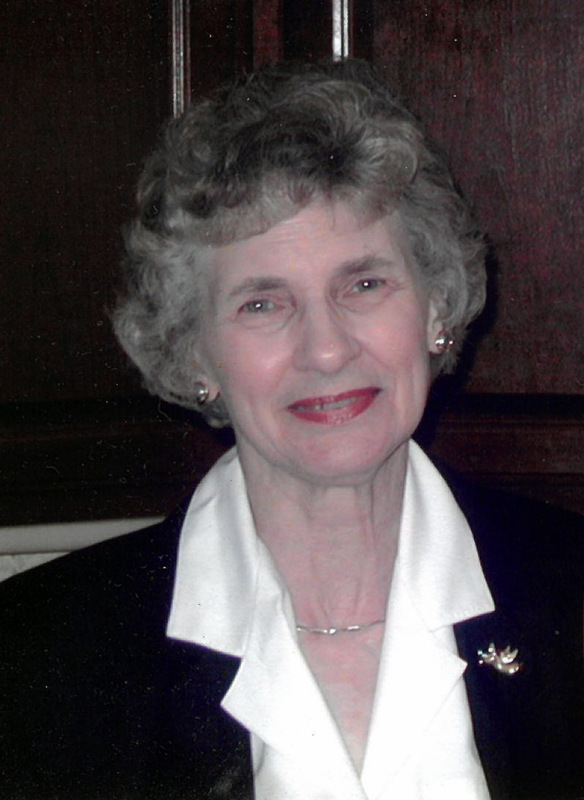 She was active in the West Virginia Wesleyan Emeritus Council, serving two terms as Council president. Mary was a devoted member of the First United Methodist Church in Clarksburg, where she and Larry raised their children and where she sang a mean soprano in the Chancel Choir led by her esteemed director Mr. Don Gardner. In recent years, Mary cared full time for her handsome Larry throughout his final illness, aided by a team of wonderful women who made it possible for her to stay in her home; and by the love and companionship of the intrepid Rocky, the final and perhaps most memorable of Mary’s lifetime of Boston terriers, who wait eagerly for their mistress. Besides Rocky, Mary goes to join her beloved husband Larry and her treasured grandson Alex Marquess; the parents and sister whom she loved and cared for; two special aunts – Ms. Iva Pfau and Ms. Dollie Coberly – whom she adored; and a caring son-in-law, John Dornblazer, who shared her love of Elkins. The family convey their deepest gratitude to her neighbors, Barbi and Robbie Mason, and to her caregivers Shirley Elbon, Mary Jane Blidgett, Barbi Mason, Karen McNemar and Lori Riddle for the kindness, cheer and tireless care they have given Mary. In lieu of flowers, the family respectfully requests that contributions be made to WV Wesleyan College, Office of Advancement, 59 College Avenue, Buckhannon, WV 26201; WVU Medicine Hospice, 327 Medical Park Drive, Bridgeport, WV 26330; or the Humane Society of Harrison County, 2450 Saltwell Road, Shinnston, WV 26431.